I have to admit that every once in a while, when I first slide out a newly purchased used record from its sleeve, I secretly hope that the record's previous owner accidentally left some weird and wonderful surprise in it--like clippings of reviews of the album or some band-related memorabilia--in addition to the original lyric sheet (which is always appreciated). In the past year or so, I've bought used LPs that contained someone's typed (on a typewriter!) and annotated lyrics for The Equators' Hot, as well as the free single that came along with the first pressing of XTC's Drums and Wires that was now in my hands. Last week, I picked up a somewhat tattered, cut-out copy of The Untouchables' Agent Double OO Soul LP. I had bought the CD at Tower Records when the album was originally released in 1988, but never purchased the LP (I was in college, didn't have much extra money, and CDs were the special new format!). 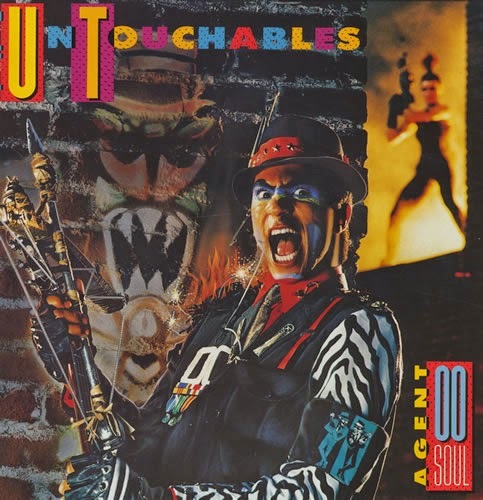 When I got around to playing the album the other day, not only did I find the vinyl to be in mint condition, but the sleeve also contained an Agent Double OO Soul comic book (which includes the songs' lyrics) and the very same promo poster that I had ordered back in 1988, which I eventually hung framed on the wall of the Moon Records store on East 10th Street (see it in the photo below). At some point in the mid-2000s, the poster was ruined--along with many other ska posters and t-shirts I had collected over the years--in a massive flood in my parents' basement. Water seeped into many of my Rubbermaid storage bins that I had been keeping there. By the time I realized what had happened a month or two later, everything was damp, rank, and moldy. I was forced to throw out bag after bag of ska history. So, I was thrilled to have another copy come into my hands all these years later. with The Untouchables poster on the wall in the background. Coming across this record reminded me that I had written a review of Agent Double OO Soul for my Fordham University, College at Lincoln Center newspaper that was paired with my write-up for Moon Records' Ska Face: An All American Ska Compilation (see a screen grab of both reviews below from the 2/22/89 edition of the CLC Observer; you can also find my review of the NY Citizens' On the Move in the 3/23/89 issue). Even though there weren't that many ska fans at my college, The Untouchables were a familiar name to many, as they opened for UB40 at a concert at Fordham's Bronx campus in the fall of 1985 (unfortunately, I did my freshman fall semester at a college out in Ohio before transferring to Fordham in winter of 1986, so I missed this performance). While my review of Agent Double 00 Soul might have been a bit overly positive and enthusiastic, it certainly wasn't the bomb that many deemed it to be. Like Fishbone's extraordinary Truth and Soul (which was released around the same time), Agent Double 00 Soul is poorly sequenced, burying all of the ska and reggae tracks on side two, many of which happen to be the strongest songs on the album (see "World Gone Crazy," "Cold City," "Shama Lama," "Cool Boy," "Education," and "Sudden Attack"). But, all in all, on Agent Double 00 Soul, The Untouchables had strayed too far from their brilliant and perfectly calibrated balance of Wild Child ska, soul, and r and b. 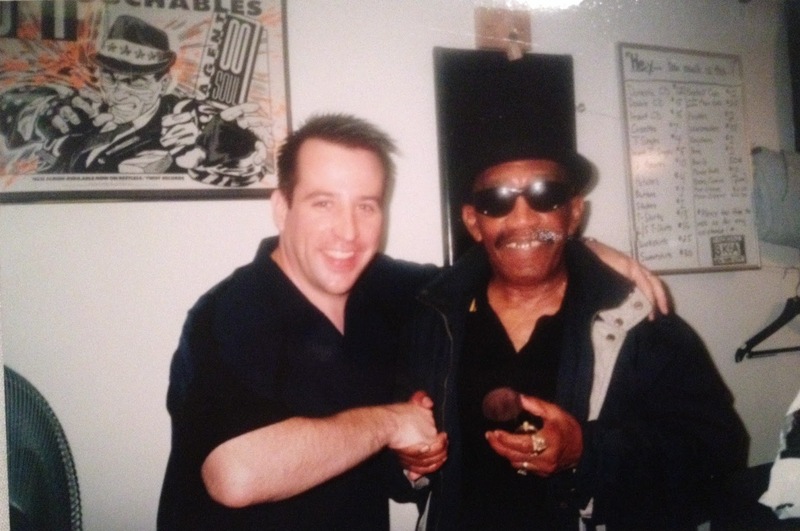 When what may have been the last NYC Untouchables' date was announced for late April of 1989 at Joey Ramone's basement Downtown club (at the corner of Bond and Broadway), my friend and fellow ska fan Andy was reluctant to see the show, since he'd heard bad things about the record from some of his other friends. 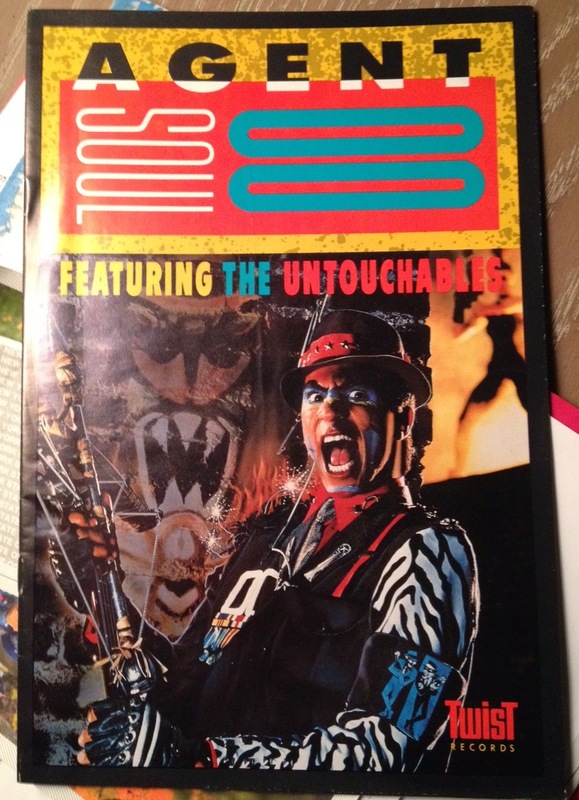 But once we were there, he was all in, as The Untouchables unleashed one of most brilliant and energetic live performances I've ever seen (Black Rock Coaltion funk-metal rockers 24-7 Spyz were also on the bill and were extraordinarily good). Much of the set was comprised of cuts from Wild Child, as well as the better ska/reggae songs off Agent OO Soul, but even some of their shakier tracks from Soul sounded pretty awesome in their live versions. Walking in the rain back up Broadway toward Union Square after the gig (we were already soaked from dancing to the UTs), Andy and I passed a construction site across the street from The Cat Club (where Moon Records' NYC Ska Live would be recorded about a year later) that had a huge, many-layered section of wheat-pasted gig posters that was starting to separate from the plywood wall in the downpour. The Untouchables' poster for their Downtown gig was on the top layer, so we liberated what must of been a three feet wide by eight feet tall section of them (with countless other posters beneath them) and somehow got it back the apartment I shared with four other Fordham students up at 125th and Broadway (where my tiny bedroom was at eye level with the elevated number 1 subway train). This giant, sagging strip of posters was propped up against one wall in my room for the rest of the semester, but ended up in the garbage when our lease was up that summer. I was moving into my first post-college apartment with a bunch of friends and my girlfriend (now wife) and this large, dirty, and unwieldy bit of music ephemera had to go; we just didn't have the space. 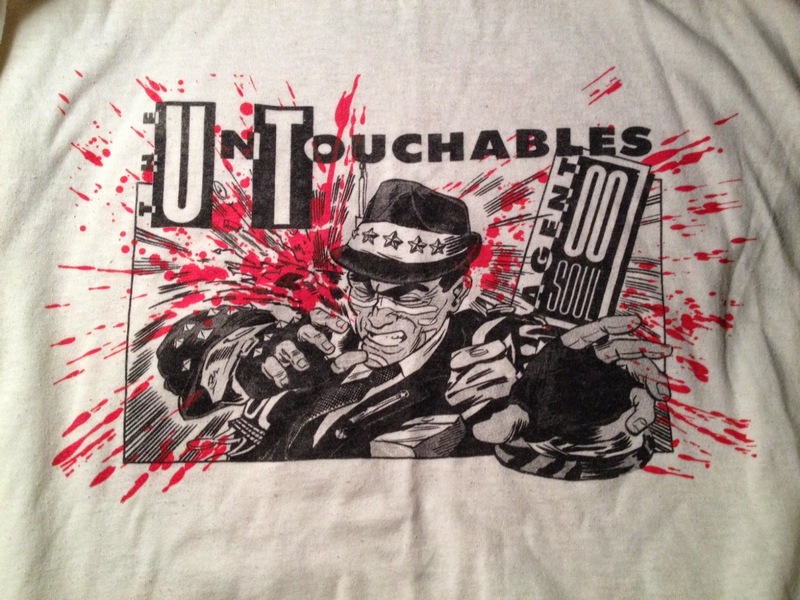 My Untouchables shirt that I bought at their gig at Downtown in Manhattan on 4/29/89. A great read. When written like this, I like nostalgic articles. Excellent article. In mid 90s I was living in Los Angeles and my brother and cousin came out to visit so they could go on surfing trip down to Mexico. I went with them as far as San Diego. Around there we were stopped for the night and looking for something to do. I checked local paper and saw the Untouchables were playing in town. I knew my brother was a big fan in college in 80s. So we all went. I didn't think I knew their stuff but once they started playing I recognized many tunes. Probably heard them coming from my brother's room back in the day. The band was great and the show was one of the best concerts I've been to. When I got back to Los Angeles I instantly picked up Decade Of Dance. It's one of my favorite live albums of all time. 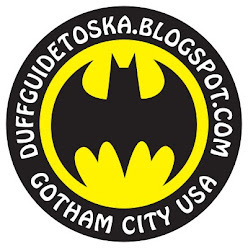 Duff Review: Radio Riddler "Purple Reggae"